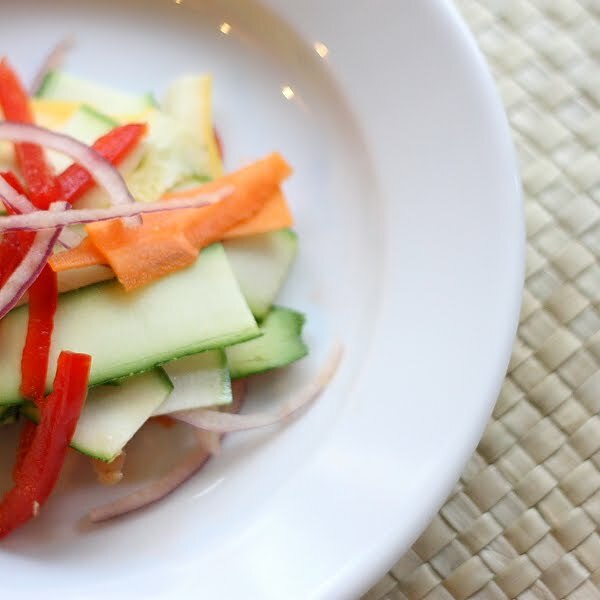 I posted this salad recipe more than two years ago, but I thought it warranted a reprise. I’ve already made it three times this spring and early summer, and I predict I’ll be making it a lot more during the height of squash and zucchini season. We had it for dinner tonight with buffalo sirloin steaks, and it was the perfect light foil to the rich, gamey meat. Looking for a simple and healthy salad to take to all those spring barbecues and potlucks you’ve got coming up? This salad has been a hit at every party I’ve taken it to. In fact, I first had it at a potluck I went to a couple of years ago. I took one bite and fell in love with it. I asked the woman who brought it how she made it, and she quickly told me the few ingredients that were in it. I ended up making it the next week for another function, and it was such a success, I’ve been taking it as my side dish to potlucks ever since. Seriously, it’s one of the simplest salads you’ll ever make. And the colors – I mean how can you resist those vibrant greens, reds, oranges and yellows? It just begs to be devoured. 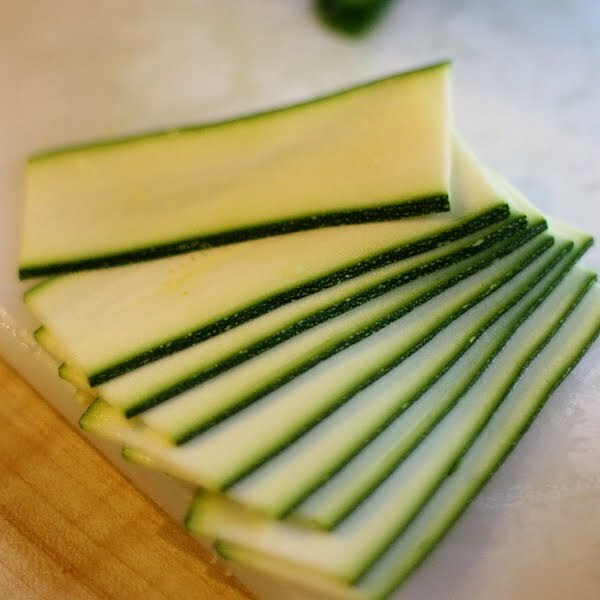 Begin by washing your veggies and slicing them into uniform slices. I used a japanese mandoline to make quick work of it, but you could just as easily use a good sharp knife. Just make sure you cut everything to a similar thickness – about an eighth of an inch. Everything remains in its natural raw state, so you want to make sure nothing is too thick to be tender. 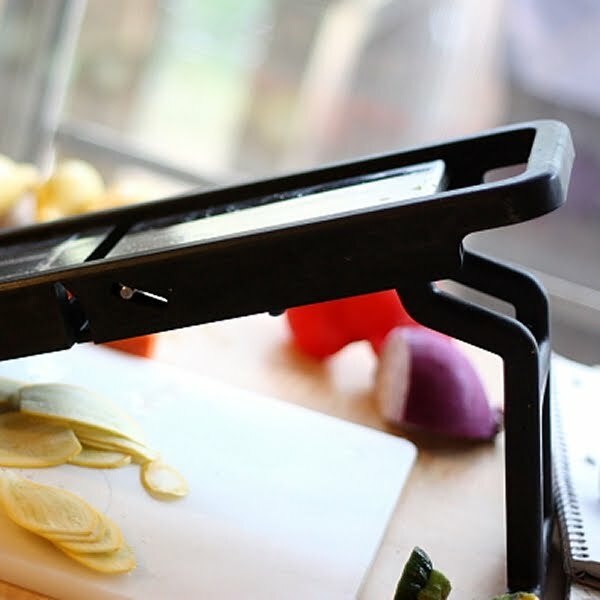 As you can see, the mandoline does a great job of giving you perfectly thin, uniform pieces. I highly recommend it (they’re a little pricey, but they come in handy for situations like this; and, they make great homemade potato chips). 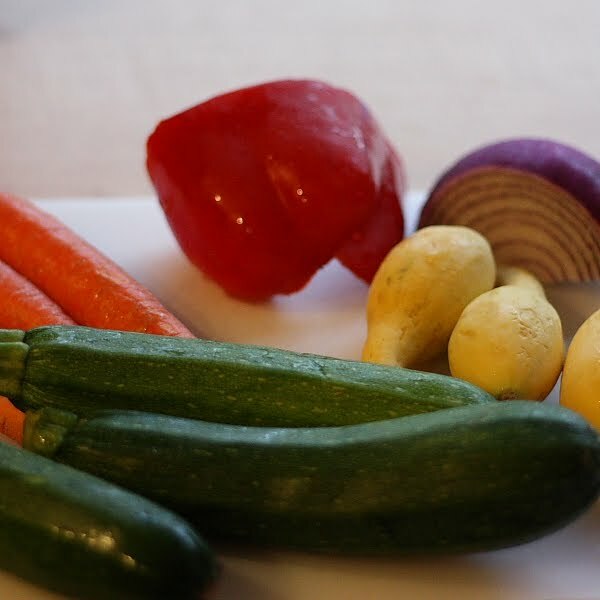 Once you’ve sliced everything (just julienne the pepper and onion), place all the veggies in a gallon zipper top bag. 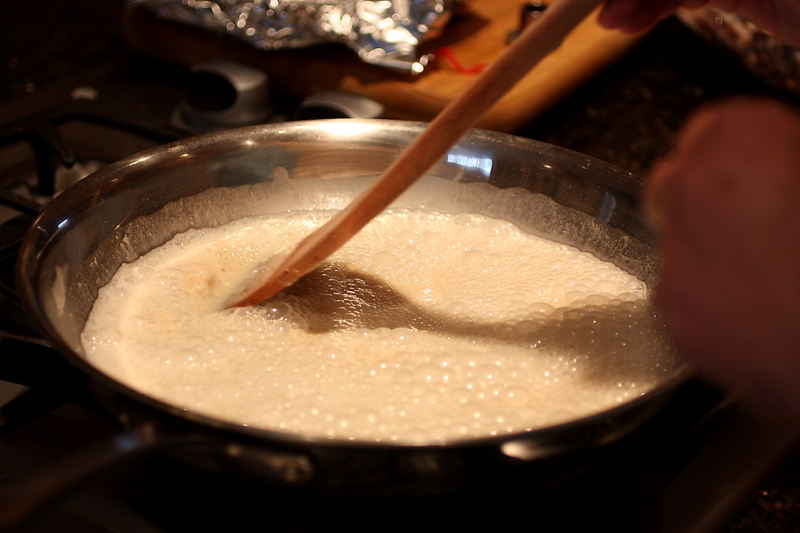 Mix the vinegar, sugar and salt together, stirring to dissolve the sugar and salt. Pour this mixture into the bag with the veg and close it up, squeezing to release as much air as possible. Let marinate in the fridge for at least two hours. Can be made up to a day ahead. The end product is a little sweet, a little sour, a A LOT delicious! 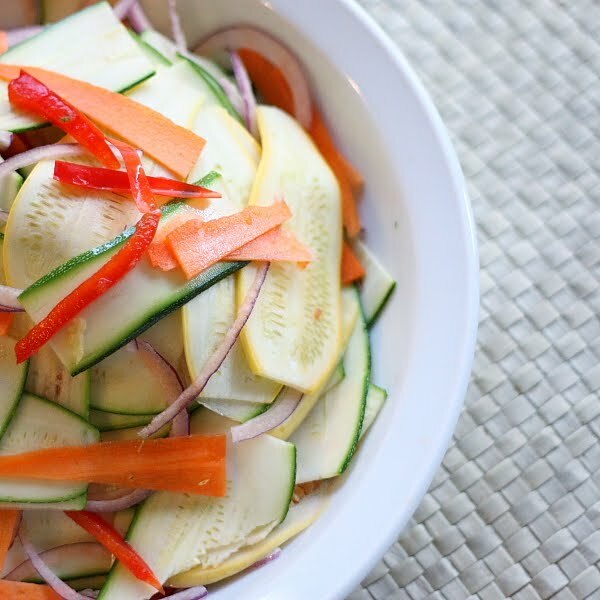 The raw squash and zucchini have a soft, velvety texture, and the crunch from the carrots and onion is a nice contrast. The onion has a nice spicy bite, and the red pepper is nice and sweet. And you just can’t beat the color! Healthy, flavorful, and beautiful – the perfect combination! There has been a tradition in our family for a number of years now of making gumbo with our leftover turkey on the Friday after Thanksgiving. I’m not sure exactly when it started, but Thanksgiving just isn’t Thanksgiving until we’ve made gumbo. My aunt even brings her own container to take it home in when she comes to visit. This year she was unable to join us, but we were thinking of her while we made it. If we could ship it long distances, it would be on its way to Florida as I type. I claim a pretty mixed-bag of southern roots. I was born in Mississippi and raised in Georgia (spending large portions of my childhood summers in the Mississippi countryside). My mother was born in Texas and grew up between Texas, Louisiana and Mississippi. Her mother was born and raised in Louisiana, and her father was born and raised in Mississippi. My father’s people are strictly Mississippi as far as I know (although now we’re all scattered throughout the US). Needless to say, my heritage is southern, through and through. 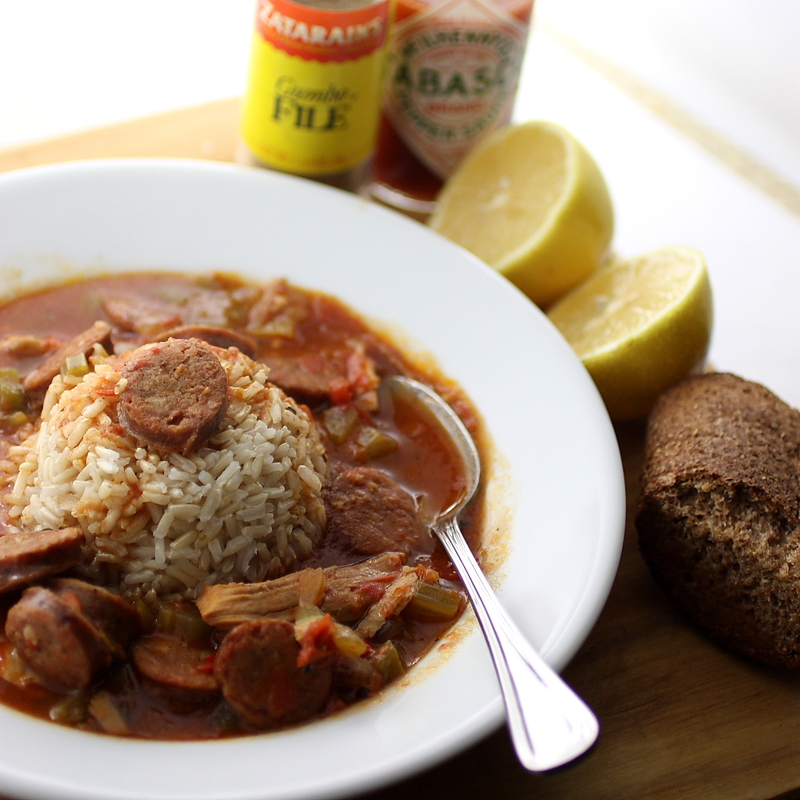 This particular recipe hearkens back to my Louisiana decedents. It is a pretty even mixture of the Cajun and Creole versions as it uses both a brown roux and file powder as thickeners, and it has a tomato base. Sometimes we add shrimp, sometimes not (this version is completely sans seafood), but we always add andouille sausage for extra flavor – this year we’re using my house-made andouille and fresh turkey stock. 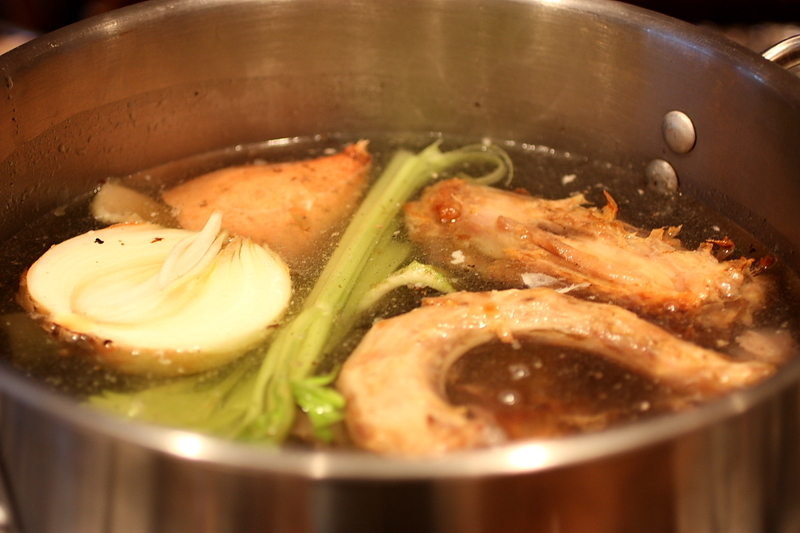 Turkey neck, backbones and carcass simmering away with celery, onion and carrot to make a lovely dark turkey stock. You can throw in pretty much anything you might have on hand, meat-wise. One year we added wild duck to the mix because my cousin had bagged a few on a recent hunting trip. When we are in Florida for the holiday (although it has been admittedly too long since we’ve gotten down there for Thanksgiving), we add lots of seafood. If you’ve got venison, toss it in there. 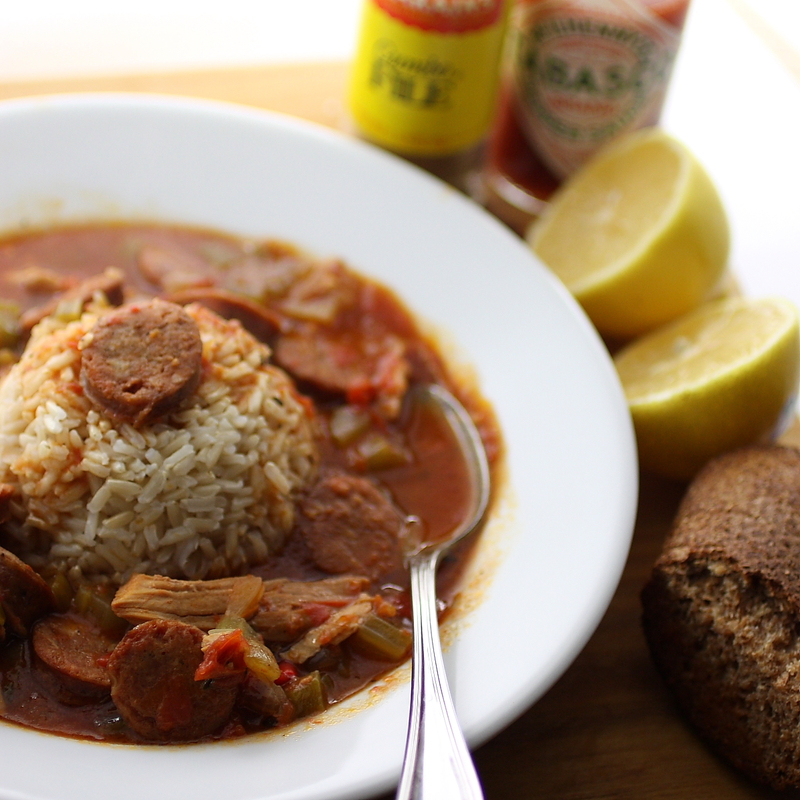 The beauty of gumbo is that it’s a perfect vehicle for using up various bits of leftovers you might have lying around the fridge and freezer. Now, I like okra in my gumbo, but my mother does not. As she will be enjoying the final product with us, we will not be adding okra to this pot. However, please feel free to add it to yours – it can only make it better (in my oh-so humble opinion). The bones of this recipe are adapted from David Rosengarten’s Dean and Deluca cookbook. If you’re familiar with Mr. Rosengarten, you know he is quite the food historian; therefore, I trust his recipes for their authenticity and their consistency. The adaptations here are that I use turkey stock in place of seafood stock or clam juice, and I use turkey in place of the crawfish he suggests. Otherwise, I follow his recipe pretty closely. Heat stock in a large stock-pot. In a large skillet, make roux by combining oil and flour. 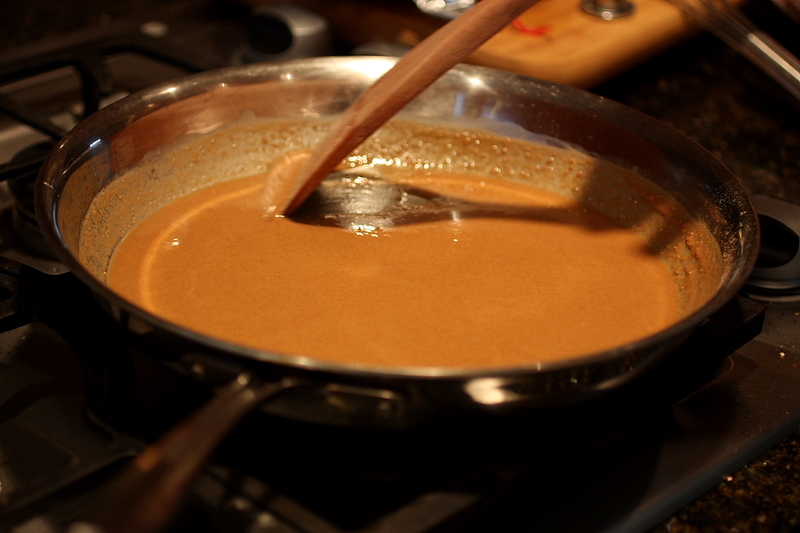 Stir constantly with a flat wooden spoon or a roux whisk over medium-low heat until mixture turns a redish-brown color. If you think it is getting too brown or about to burn, immediately remove it from the heat. 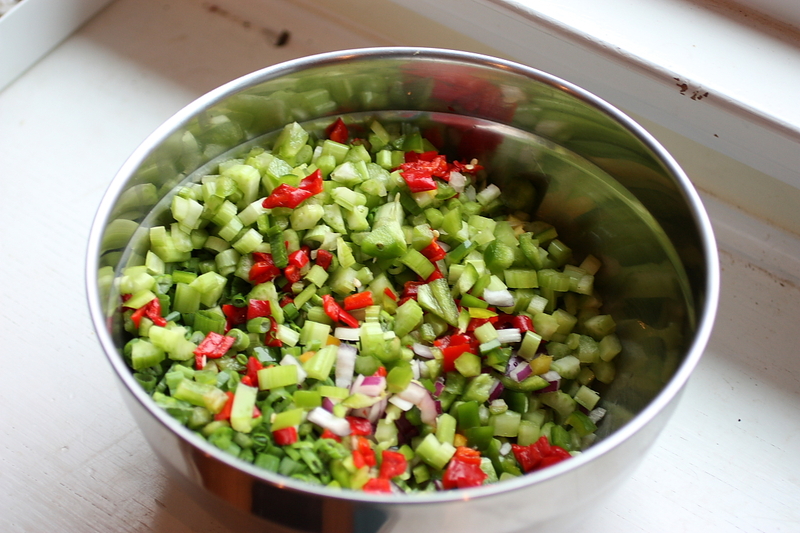 Add chopped garlic, onions, peppers, celery and green onion to the roux to stop the cooking. Add the roux to the hot stock and whisk to combine. Add the tomatoes, bay leaves, thyme, oregano, cayenne and cloves. Now add the sausage and the turkey. Let simmer over low heat for 3 hours or more. Serve over boiled rice. Add hot-sauce, a squeeze of fresh lemon juice and 1/2 to 1 teaspoon of file powder to individual bowls. 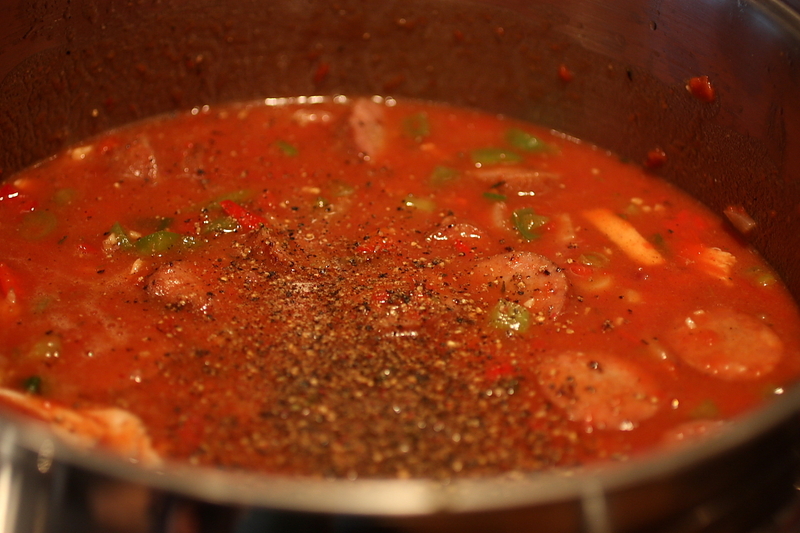 Do not add file powder to gumbo while it is cooking, as it will result in a stringy-textured end product. I recommend this as a different way to use up that leftover turkey you’ve got taking up space in your fridge. You’ll probably still have some left for turkey sandwiches, but this will give new life to what might otherwise be considered boring Thanksgiving leftovers. Sometimes I get bored with leftovers. After I’ve eaten something once or twice, I’m ready to move on. But I also hate to let things go to waste, which is where the ability to re-purpose and re-envision ingredients comes in handy. The other day, I was faced with an abundance of green beans from the garden and some leftover grilled flank steak in the fridge. We do a lot of southwest and Latin influenced meals, but I wasn’t really in the mood for fajitas or tacos or burritos on this particular day. Besides, the green beans didn’t really fit into that flavor profile. I decided instead to go the Asian route and do a stir fry, incorporating some rainbow carrots from the garden, and some red bell pepper and sweet yellow onion. I didn’t really use a recipe, just went on instinct and tasted as I cooked. I served it all over some brown rice. This is a great example of improvisation in the kitchen, using the ingredients you have on hand to dictate the outcome rather than the other way around. Heat oil in a saute pan over high heat. Combine the soy sauce, vinegar and sugar and add to the pan. Stir to coat the ingredients. Remove pan from the heat and cover. Allow to sit for a few minutes so the green beans will steam to finish cooking. Add the basil just before serving. 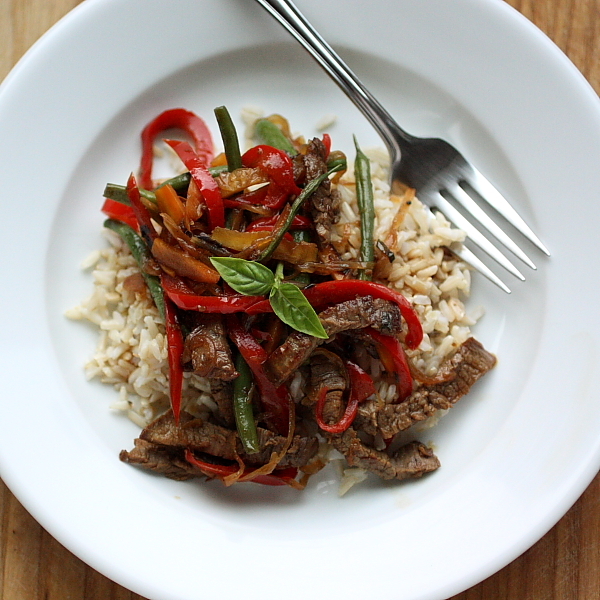 Serve over cooked rice with a little of the pan sauce. Garnish with a sprig of basil. 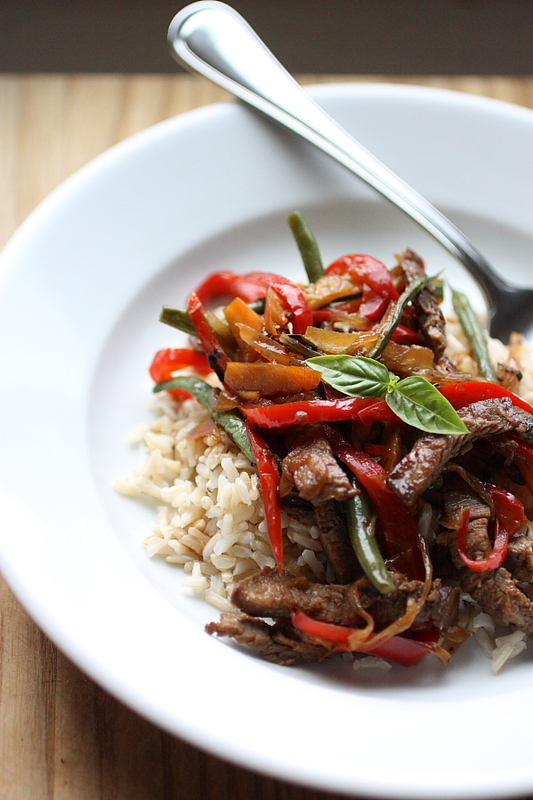 I spiced mine up a bit by adding some of my favorite fermented chili paste – it played very well against the sweetness of the basil. So, what are your favorite ways to improvise in the kitchen? 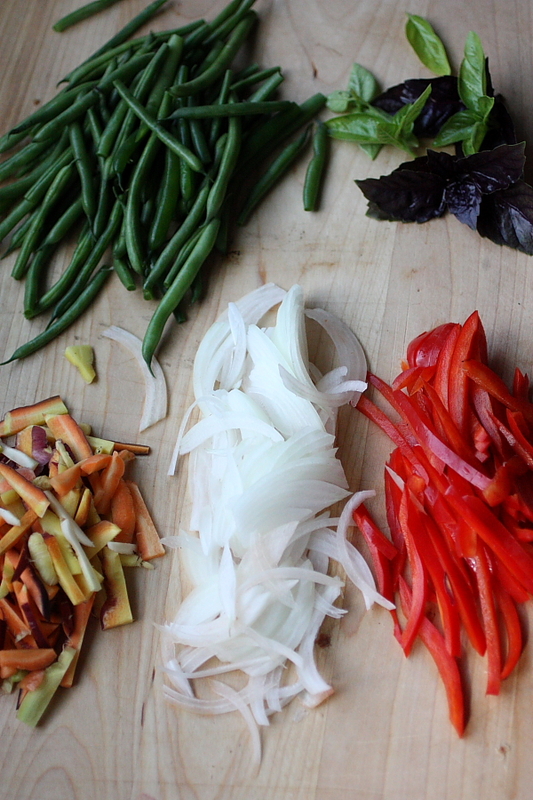 Do you choose your ingredients based on a recipe, or do you like to let your ingredients dictate your dinner?